"Located in one of the most distinguished streets in Madrid, Loft39 offers the perfect combination: a spacious restaurant with a rejuvenated traditional air together with a modern and suggestive lounge bar. The combination is powerful. You only have to take a look at the menu to verify that any choice will be a success. The presentation of the dishes is as original as the flavors are striking. Indifference has no place with starters such as Guernica peppers with white garlic foam, fish like sea bass in milk of pine nuts, or meat as special as patties of beef tenderloin with sage and chutney of mango, an icon of the place. The intimate and looked after space accompanies a feast that can be easily extended in the lounge room. A privilege that is appreciated, because there is nothing more practical than changing spaces without leaving the site. 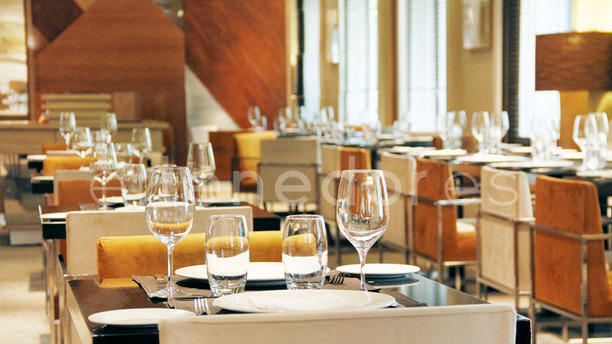 The world of hospitality has adapted to the sedentary lifestyle which society boasts. Maybe that is why the number of places which unite cuisine and entertainment under one roof has already increased. Aware of how much everyone likes to prolong a good dinner with a drink afterwards, they have found the best solution for all." Car park C/ Velázquez, 27. Parking Velázquez - Ayala. Excellent food, environment and service. Delicious cava. Traminer ons of my favorite spots on Velazquez. Large sophisticated restaurant. Food is inventive and top quality. Service is excellent. Great atmosphere. Recommended. Excellent. Our friends enjoyed it very much. Very nice place, great food and presentation. Lugar, productos y ambiente inmejorable!